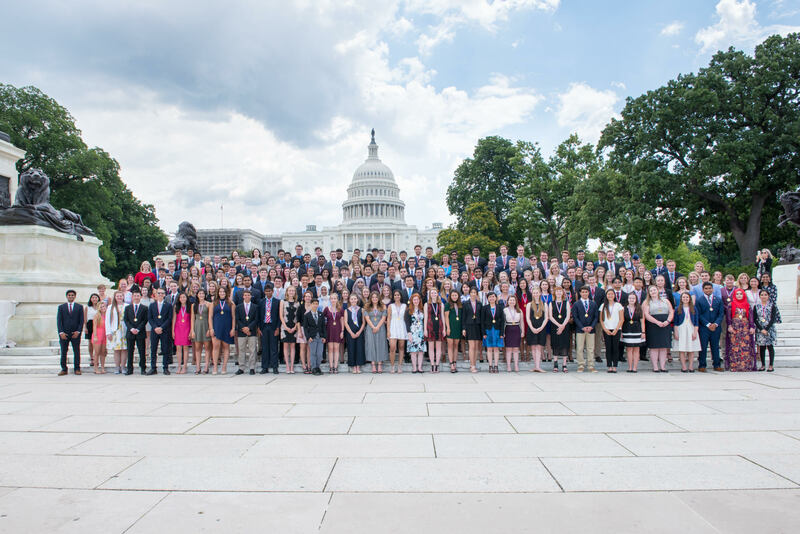 On June 21, 2017, Members of the United States Senate and House of Representatives honored 373 youth across 39 states at the 2017 Congressional Award Gold Medal Ceremony. Recipients of The Congressional Award Gold Medal have earned the highest honor Congress bestows upon a youth civilian. For a minimum of two years, each Gold Medalist logged at least 800 hours across four program areas: Voluntary Public Service, Personal Development, Physical Fitness, and Expedition/Exploration. The 2017 Gold Medal class was the largest in the program’s 38 year history, representing an unprecedented year of servant leadership. This special recognition event took place in the U.S. Capitol Visitor Center Congressional Auditorium, located on Capitol Hill in Washington, D.C.
Two award ceremonies were held to accommodate family members and special guests. Wolf Blitzer of CNN’s The Situation Room and Mateo Magdaleno, Congressional Award Board Member and Chief Education Officer of IDQ Group, Inc., served as the Masters of Ceremonies. The Congressional Award Foundation also recognized Dr. Wiley Dobbs with the Inspiration Award for his exemplary service in advising Congressional Award participants. Dr. Dobbs is the retiring Superintendent of Twins Falls School District #411 in Idaho. Senator Mike Crapo and Senator Jim Risch presented the award and provided a testimony of Dr. Dobbs’ lifelong commitment to mentoring youth. View the complete list of 2017 Gold Medalists. The Community Impact Report demonstrates the vast reach of a Congressional Award Gold Medalist. Senate Majority Leader Mitch McConnell commemorated the 2017 Gold Medalists by adding their achievement to the Congressional Record. Download a PDF copy of the 2017 Gold Medal Ceremony Program Book.